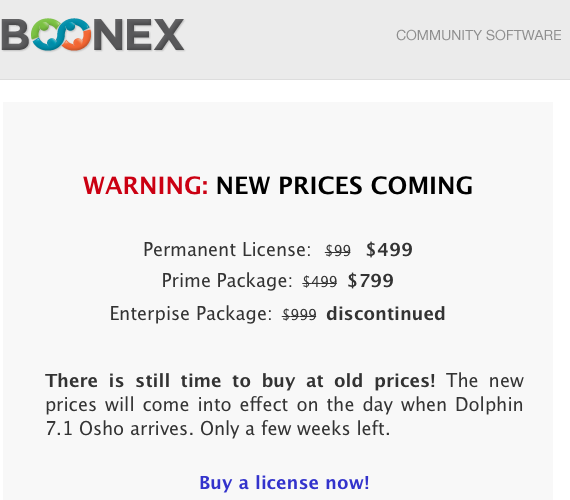 For those of you that have been thinking about buying a Boonex Dolphin license, but have been putting it off you might want to grab one very soon. I just received (October 1st, 2012) this email message stating that not only are Dolphin licenses going up, but they are going up substantially the day Dolphin 7.1 arrives. Ouch! Just look at the increase! 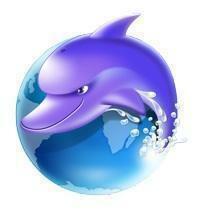 That means once Dolphin 7.1 is available the cheapest price for a license will be $499. A $400 increase! Personally I think $499 is too much for a license. I know Boonex has been talking about increasing the price once Dolphin 7.1 comes out, but I was expecting more along the lines of $129, $149, or at most $199. I didn't expect it to go up this much. I don't recall seeing Boonex giving an exact date when the new version will be out. All I have seen them mention is soon, or in the near future. Notice in the screen shot it says: "Only a few weeks left." At any rate, get a Dolphin License soon if you have been thinking about one. It's almost like getting 5 for the price of one when you consider what they will be going up to in a few weeks.